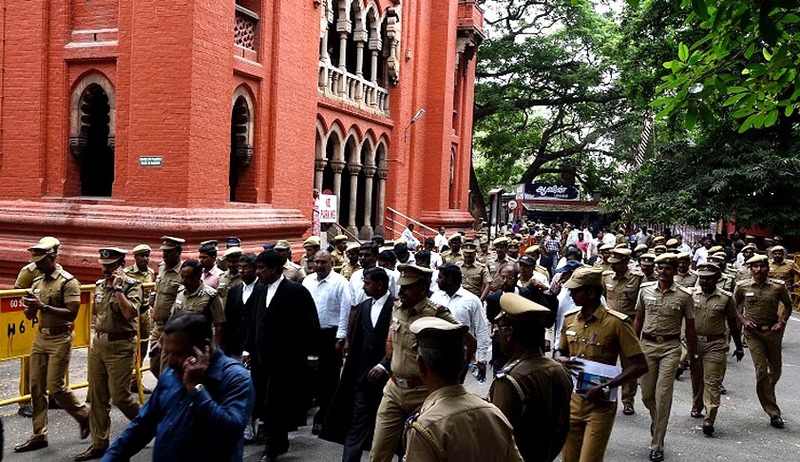 Raising serious concern over the violence indulged in by lawyers in the Madras High Court premises, the Supreme Court today refused to interfere with HC’s order for deployment of CISF by replacing state police security in the court complex. The Tamil Nadu government had moved the SC on November 2. Supreme Court said nobody, including the lawyers, can be allowed to hold to ransom the institution which has to remain effective by maintaining its integrity and dignity. The apex court made it clear it was not going to examine the issue at the instance of the state government which has filed an appeal against the High Court order of October 30. The Chief Justice (of the High Court) and judges are entitled to say that the police is ineffective. “You cannot allow the institution to be held to ransom. We will not allow this to happen”, a bench comprising Justices T S Thakur and P C Pant said. “They (judges) felt they are totally insecure with the local police. They have asked CISF to step in. If CISF also fails then other forces may be asked to be called,” it said. The bench did not agree with the arguments of Tamil Nadu Government counsel and Senior Advocate L Nageshwar Rao that paying an hefty amount of Rs 36 crore per year to the Centre for deploying CISF would be a problem and, further, deputing central force would affect the morale of the state police. He said there would also be a language issue with the CISF at the High Court campus which is visited daily by 15,000 lawyers. In a strongly-worded petition, the State government accused the Union Ministry of Home Affairs (MHA) changing its stance in the issue without notice. It said that the Centre had at first agreed that there was no need for deployment of CISF at the High Court premises, but then changed its position to demand Rs. 16.6 crore from the State government for sending in CISF personnel.